Sleek, clean, and modern, the Women's 3.ZERØGRAND Oxford is designed with flexible support and serious comfort in mind. Offering an innovative and unique aesthetic, this updated oxford is styled as a slip-on for easy on/off and a custom yet secure fit. Perfect for today's on-the-go lifestyle, an all-new Fit Chassis support system runs from the forefoot to the heel and provides support, rigidity, and flexibility in the areas where your foot needs it the most. Best shoes for work. I can last 11-12 hours in these shoes and still keep going! Love these! I bought them in blush with the pink some and had to have the black too! Comfort is amazing!!! Love it! Stylish and very comfortable! "very" wide for a M .
Not quite right for my foot and not waterproof. Tried on this style last week at the Rock Center store. Was going to order online but decided to try on first because their shoe sizes fluctuate from style to style. I wear anywhere from a 6.5 to an 8 in their shoes. The boots often run small so I size up. This shoe ran large so I needed at least a half size smaller. It was warm out so decided to wait a few weeks and retry along with newer waterproof shoes. I bought the waterproof Grand Explore boots in 2 colors last winter and 2 prs of waterproof tall Grand os boots and my feet stayed dry and they worked better than Wellies and looked great. Lately it rains all the time in NYC so their waterproof technology is really appreciated in a city where I can walk faster than a car or city bus. I’m a big Cole Haan shoe fan. I would recommended this shoe for looks, comfort and quality. Most comfortable shoe with proper arch support that has contemporary style! Very comfortable, I like a sturdy leather instead of soft suede. Needed a pair of comfortable shoes for work. These look classy and would suit my all black work clothes. I saw these in the Cole Haan store and they were cute. A change from the Cole Haan shoe I normally wear. This shoe is easy to slip on and off and is super comfortable for walking around the city and on cobblestones and bricks. It provides good support and looks great with jeans. I have had before and they are very comfortable and nice looking. A good alternative to sneakers. because I bought another pair in pink/gray and they're the most confortable ever!!! i have many Cole Haan Zerogrand and 2.Zerogrand shoes that are very comfortavble so I cant wear other brand shoes. At this time I want to try 3.Zerogrand Oxford. My friend got a pair and raved about how comfortable they were plus they look nice. This shoe is comfortable and stylish. 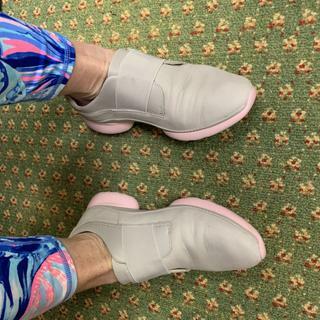 It is a simple slip on which is an added benefit because I travel a bit and this shoe helps speed me through airport security. It is also a great walking shoe in the city! This look adorable and comfortable. Two things that are rare to find. When will wide fitting be available? BEST ANSWER: 3.ZeroGrand is a brand new Collection for us and at this time, it is available only in B or Medium width. Stay tuned to the website in the coming weeks and months for additions to this collection! Is this better to match with professional clothing or the Chelsea style ankle boots from Cole Haan? BEST ANSWER: My choice would be the 3.Zerogrand Oxford. The oxford is very comfortable; looks great with pants and also with skirts if appropriate stockings or tights are worn. How long does it take to break in for the leather black-black? BEST ANSWER: I bought these for my sister who is a teacher and on her feet for hours daily. She states that after 2 wearings, these shoes are the best pair she has had in years. She says she has done her BEST TEACHING this YEAR due to the comfort she has in these shoes!!! No break-in period needed. These are comfortable from the start. Enjoy! They broke in instantly the first day I wore them. Which type and would you recommend to use a spray for waterproof on the shoes? BEST ANSWER: Four Seasons Weather Guard for leather,suede,nubuck and fabric. Protect from water and oil based stains. BEST ANSWER: The insole is not removable. We do not suggest trying to remove it as it will damage the shoe. Sorry - our footwear is not designed to accommodate orthotics. How do you adjust for foot width? I have a narrow foot. BEST ANSWER: If you have a narrow foot, you should look at styles that are available in Narrow, (designation N or AA) width. To find currently available styles in your size/sizes and widths, you can use the drop-down filter tabs on the side of the shoe page to shop by size, width, color and more. If you are unsure of your width, you should visit a reputable shoe store or department and have your foot measured on a Brannock device. BEST ANSWER: Not at all. While the new, exclusive 3.ZeroGrand sole is crafted from synthetic materials which are impervious to moisture like wet pavement, the leather uppers are fine, smooth leather and not at all water-friendly.